There are two classes of volcanic hazards, direct and indirect. Direct hazards are forces that directly kill or injure people, or destroy property or wildlife habitat. Indirect hazards are volcanism-induced environmental changes that lead to distress, famine, or habitat destruction. Indirect effects of volcanism have accounted for approximately 8 million deaths during historical times, while direct effects have accounted for fewer than 200,000, or 2.5% of the total. Some of the more important types of volcanic hazards are summarized in Table 4.2. Large volumes of tephra (rock fragments, mostly pumice) and gases are emitted during major plinian eruptions (large explosive eruptions with hot gas a tephra columns extending into the stratosphere) at composite volcanoes, and a large volume of gas is released during some very high-volume effusive eruptions. One of the major effects is cooling of the climate by 1° to 2°C for several months to a few years because the dust particles and tiny droplets and particles of sulphur compounds block the sun. The last significant event of this type was in 1991 and 1992 following the large eruption of Mt. Pinatubo in the Philippines. A drop of 1° to 2°C may not seem like very much, but that is the global average amount of cooling, and cooling was much more severe in some regions and at some times. Over an eight-month period in 1783 and 1784, a massive effusive eruption took place at the Laki volcano in Iceland. Although there was relatively little volcanic ash involved, a massive amount of sulphur dioxide was released into the atmosphere, along with a significant volume of hydrofluoric acid (HF). The sulphate aerosols that formed in the atmosphere led to dramatic cooling in the northern hemisphere. There were serious crop failures in Europe and North America, and a total of 6 million people are estimated to have died from famine and respiratory complications. In Iceland, poisoning from the HF resulted in the death of 80% of sheep, 50% of cattle, and the ensuing famine, along with HF poisoning, resulted in more than 10,000 human deaths, about 25% of the population. Volcanic ash can also have serious implications for aircraft because it can destroy jet engines. For example, over 5 million airline passengers had their travel disrupted by the 2010 Eyjafjallajökull volcanic eruption in Iceland. In a typical explosive eruption at a composite volcano, the tephra and gases are ejected with explosive force and are hot enough to be forced high up into the atmosphere. As the eruption proceeds, and the amount of gas in the rising magma starts to decrease, parts will become heavier than air, and they can then flow downward along the flanks of the volcano (Figure 4.23). As they descend, they cool more and flow faster, reaching speeds up to several hundred km/h. A pyroclastic density current (PDC) consists of tephra ranging in size from boulders to microscopic shards of glass (made up of the edges and junctions of the bubbles of shattered pumice), plus gases (dominated by water vapour, but also including other gases). The temperature of this material can be as high as 1000°C. Among the most famous PDCs are the one that destroyed Pompeii in the year 79 CE, killing an estimated 18,000 people, and the one that destroyed the town of St. Pierre, Martinique, in 1902, killing an estimated 30,000. The buoyant upper parts of pyroclastic density currents can flow over water, in some cases for several kilometres. The 1902 St. Pierre PDC flowed out into the harbour and destroyed several wooden ships anchored there. Most of the tephra from an explosive eruption ascends high into the atmosphere, and some of it is distributed around Earth by high-altitude winds. The larger components (larger than 0.1 mm) tend to fall relatively close to the volcano, and the amount produced by large eruptions can cause serious damage and casualties. The large 1991 eruption of Mt. 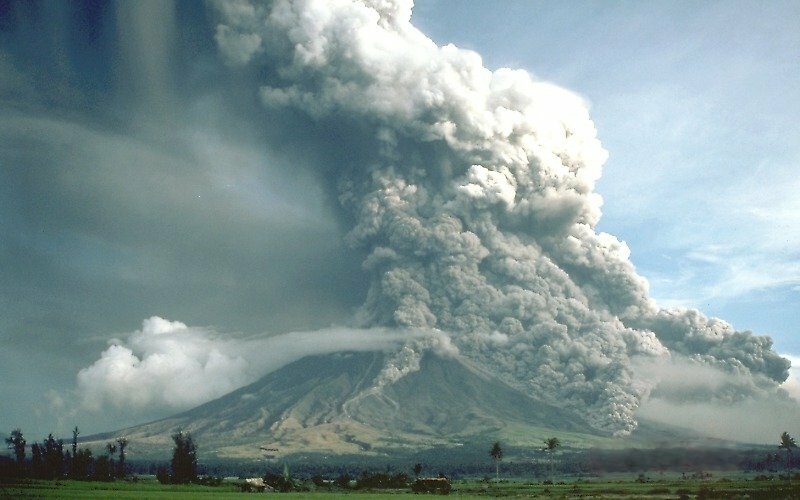 Pinatubo in the Philippines resulted in the accumulation of tens of centimetres of ash in fields and on rooftops in the surrounding populated region. Heavy typhoon rains that hit the island at the same time added to the weight of the tephra, leading to the collapse of thousands of roofs and to at least 300 of the 700 deaths attributed to the eruption. A lahar is any mudflow or debris flow that is related to a volcano. 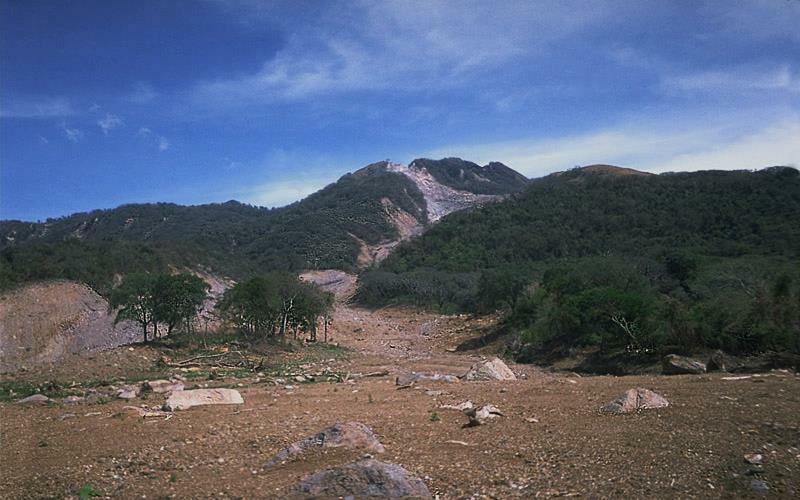 Most are caused by melting snow and ice during an eruption, as was the case with the lahar that destroyed the Colombian town of Armero in 1985 (described earlier). Lahars can also happen when there is no volcanic eruption, and one of the reasons is that, as we’ve seen, composite volcanoes tend to be weak and easily eroded. In October 1998, category 5 hurricane Mitch slammed into the coast of central America. Damage was extensive and 19,000 people died, not so much because of high winds but because of intense rainfall — some regions received almost 2 m of rain over a few days! Mudflows and debris flows occurred in many areas, especially in Honduras and Nicaragua. An example is Casita Volcano in Nicaragua, where the heavy rains weakened rock and volcanic debris on the upper slopes, resulting in a debris flow that rapidly built in volume as it raced down the steep slope, and then ripped through the towns of El Porvenir and Rolando Rodriguez killing more than 2,000 people (Figure 4.24). El Porvenir and Rolando Rodriguez were new towns that had been built without planning approval in an area that was known to be at risk of lahars. In the context of volcanoes, sector collapse or flank collapse is the catastrophic failure of a significant part of an existing volcano, creating a large debris avalanche. This hazard was first recognized with the failure of the north side of Mt. St. Helens immediately prior to the large eruption on May 18, 1980. In the weeks before the eruption, a large bulge had formed on the side of the volcano, the result of magma transfer from depth into a satellite magma body within the mountain itself. Early on the morning of May 18, a moderate earthquake struck nearby; this is thought to have destabilized the bulge, leading to Earth’s largest observed landslide in historical times. The failure of this part of the volcano exposed the underlying satellite magma chamber, causing it to explode sideways, which exposed the conduit leading to the magma chamber below. The resulting plinian eruption — with a 24 km high eruption column — lasted for nine hours. 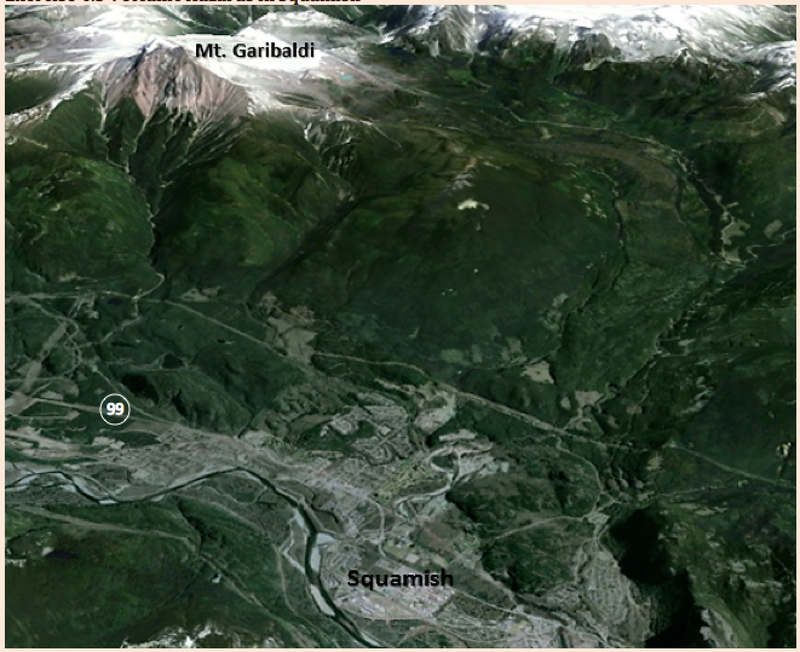 In August 2010, a massive part of the flank of B.C.’s Mt. 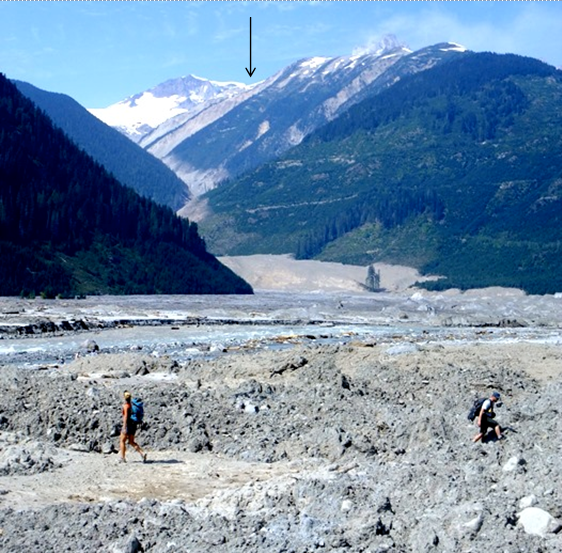 Meager gave way and about 48 million cubic metres of rock rushed down the valley, one of the largest slope failures in Canada in historical times (Figure 4.25). More than 25 slope failures have taken place at Mt. Meager in the past 8,000 years, some of them more than 10 times larger than the 2010 failure. As we saw in Exercise 4.4, lava flows at volcanoes like Kilauea do not advance very quickly, and in most cases, people can get out of the way. Of course, it is more difficult to move infrastructure, and so buildings and roads are typically the main casualties of lava flows. 4.4 Volcanic Hazards by Steven Earle is licensed under a Creative Commons Attribution 4.0 International License, except where otherwise noted.